Tiger pufferfish also known as the Japanese pufferfish is a potentially poisonous fish used in high class cuisine. It is common in the North Pacific especially in the waters surrounding Hokkaido, Japan. It can be eaten as sashimi in sushi restaurants or added to a hot pot. 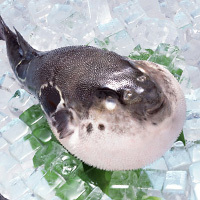 The calories in Tiger Pufferfish per 80g(1fillet) is 68 calories. Tiger Pufferfish is calculated to be 85Cal per 100 grams making 80Cal equivalent to 94.12g with 15.44g of mostly protein、0.24g of fat、0.16g of carbohydrates in 80g while being rich in vitamins and minerals such as Vitamin B12 and Vitamin D.